This week we got a chance to speak with Shane Lawrence of George’s Custom Paint & Nostalgia Station in Lindsay Ontario. 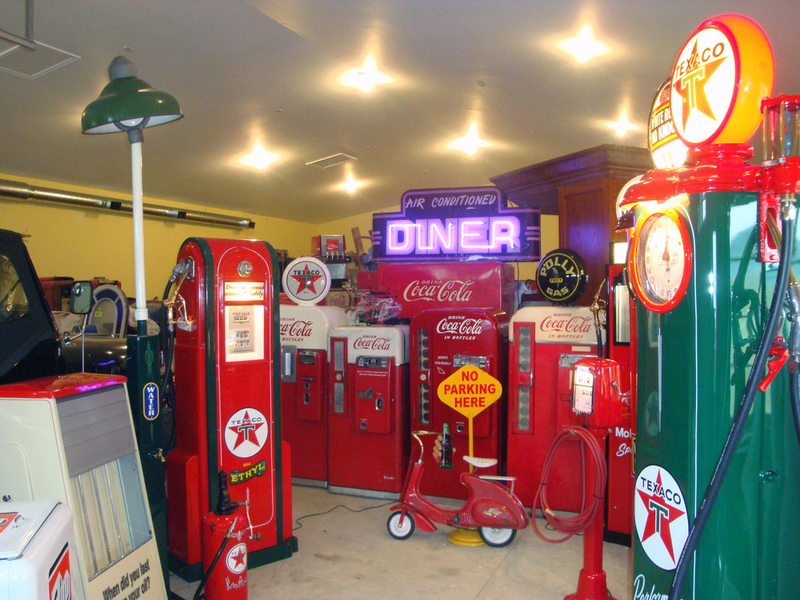 If you’ve ever wanted to put a museum grade restoration of an antique gas pump or vending machine in your man-cave, you’ll want to know about George’s. LR: Shane, thanks for taking the time to speak with us. First, how long have you been in business, and who’s George? Shane: George is my Dad, we have a family business. He started the business 35 years ago and we both work together in a partnership. He’s still here working. LR: You must have been at this for a while then. Did you start helping Dad as a young kid? Shane: Yeah, my Dad started out with an auto-body shop and also did restorations. So as a kid it was mostly helping with work on cars. Then in the mid 90’s we slowly transitioned into antique coin-op restorations. I’ve been working with him since I was about 12. LR: What sort of volume of devices are you guys able to restore in a given time frame? Do these projects take months? years? Shane: The wait list for custom work can be over a year, but we always have a healthy stock of machines that are finished and ready to go in our showroom. We’re usually working on ten to fifteen machines at any given time. Sometimes we have to wait for parts, wait for chrome, wait for pin-striping, stuff like that. We probably finish about five or six projects a month. LR: How rare are the machines to find for your projects? Where do you even look for them? And how rare is the expertise to do these restorations? Shane: We have a unique situation. There’s very few people in Canada who do what we do. We travel to the states four or five times a year to go on buying trips to get these machines in the rough. We go to a lot of different antique shows and we have people down in the states that we deal with that look for stuff for us. They know what we want and gather it as they can and we’ll go to pick it up from them. We also buy and sell antiques without restoring everything. Antique painted signs, porcelain signs, older advertising stuff. LR: Sounds like quite an operation. What is the most difficult part of the restoration process then? Doesn’t sound like finding clients or the materials is that difficult for you. Shane: For a lot of these machines often spare parts can be hard to find. If we can’t find a part for a machine, we have to make it. So there’s a lot of machining that goes into some of them. If a client brings us a machine themselves but it’s missing some components, you can’t just order them from the manufacturer. Most of the manufacturers are long gone. So to adapt we either have to find parts on the internet if we can, or we’ve got to make the part which can be quite a challenge sometimes. LR: I can only imagine. Does that give you guys an opportunity to utilize any newer technologies? Are you 3D scanning or printing any of the parts yourselves? Shane: We don’t really get into the parts manufacturing ourselves. We prefer to deal with high quality machine shops who specialize in that production. My uncle actually owns a machine shop in Toronto, and we’ll work with him whenever we can. He’s got all the fancy machines; it’s a whole other business. We’d rather focus on what we know best and have the parts made by the guys who know that best. LR: That makes a lot of sense. Shane: We’ll do drawings for what we need obviously, and if we need one part we’ll make five or ten of them. That let’s us have some stock for the same situation in the future or we can sell some to others who may need them. We’re always part hunting with other shops in the states and everybody tries to help each other out when they can. LR: How big is the community of other shops like yours? I must be somewhat small I’d think. Shane: Well, there’s quite a few down south. We’re lucky up in Canada as there aren’t a lot of places that do it, so we don’t have a whole lot of competition. But in the states there are many who do what we do and we have networked with them over the years. We meet up at shows or get in touch online. There are a lot of resources for us in the community. Depending on what we’re looking for there’s certain people we’ll call. LR: How about your clientele? Where are they from and who are they? Shane: We have a little bit of everything for clients. We have some who order five to ten machines a month that are filling museums. We have some who will get their one machine and be content with just that. We get lots who will buy a few, they’ll have friends or family come over and like them a lot. Then those friends and family call us for their own. We do have a lot of repeat clients like that, and we also ship worldwide. We deal with a very reputable shipping company and we build our own custom professional crates and pallets in house. We’ve shipped machines to Switzerland, Sweden, Germany, lots of other places in Europe, all over the States, in Canada, Australia… all over the world. LR: Wow! That’s quite the list. LR: How about clients bringing you sentimental items of theirs as opposed to you hunting down what they are after? Shane: Oh yes, we get that all the time. They’ll bring us their father’s coke machine, gas pumps that belonged to their grandfather. Sometimes they might not have the actual machine but they’ll have a very specific memory of a particular item. They’ll remember working at a gas station and want that exact machine from that era. So we’ll do research with them and try to figure out exactly what they were using. We do everything we can to try and replicate that memory for them exactly. LR: That’s amazing. So there’s some anthropology to it as well then. Shane: Yes, we really try to get everything period correct. For example someone might say they want a Red-Indian gas pump from this specific year, say the 50’s or 60’s, and we have to tell them that those pumps weren’t made in those years. They’ll actually be looking for a pump form the 30’s or 40’s most likely. We really make sure that all our restorations are done period correct so that if a person later decides to sell their machine we know the collectors interested in buying that item are not going to see anything off about it. This protects our clients to ensure they’ll get top dollar for their machines as collectors can be very particular about those details. LR: That speaks highly of your reputation to put that level of care into getting the restorations right. Incredible level of detail. Shane: Thanks, yeah we do our best and it works out well. LR: Do you have a favorite type of machine to restore? Shane: I really like anything challenging. We do a lot of Coke machines here, a lot of gas pumps. They’re fun but I always like doing something unique, something I’ve never done before. Maybe an exotic cigarette machine, or a Jacob’s ’56 Pepsi machine, they’re fun to do. All the projects we have are a lot of fun though. LR: And how about the custom painting side of the business. What sort of other work does that entail? Shane: Well, we mostly just do the antique machines and some sign restoration painting. My Dad’s an airbrush artist. Maybe he’ll do a hockey helmet for someone on a special occasion but we’re focused on the restorations now. LR: I see. Last question for you. What do you suggest to any potential new clients for their first machine if they want to dive into this world without a particular idea in mind? Shane: Most people start with a gas pump or a coke machine. The coke machine is a great place to keep your beer or pop, and the gas pumps always look great lit up in the corner of a man-cave. Then from there they’ll usually want other machines. Candy machines, cigarette machines, other vending machines. It’s funny, it’s almost like the bug bites them and after a few years they’ll have five or ten of them at home. LR: Ha! Sounds like a great business to be in. Shane: Yeah, it’s good that way for sure. You know, if a person’s not sure what they want we’ll suggest that they come see us and walk through the showroom. They get an idea of what we have, we get an idea of the space they have, the colors they like. We try to steer them the right way on what we have in stock or what they might like to order. Big thanks to Shane and his family for giving us a glimpse into their fantastic operation. Many of the photos in this article are in stock items at George’s right now. If you think one of Shane and George’s restored vintage machines might be the perfect addition to your home or garage you can give Shane a call at 905-751-9139 or visit their website. Previous The Most Unusual And Expensive Coffee Tables We’ve Ever Seen!